400+ lizard and crayfish containers, 200+ fishtanks, clothes lines turned 3D camera calibration, bird cages, fish nets, koala catching poles, herp funnel traps - What have we not worked on! So many fish tanks for Mosquito fish and Gobby research - all has come to an end....until next time. With music blaring (although hard to hear with so many people), a designated job mat to allow Skye to delegate cleaning jobs, catch ups on everyone's research and plans for the weekend we somehow got the lab, field storage unit and student office cleaned up and organised within 2 hrs. Even the microwave and fridges got a clean - Thanks Nat and Gwen! 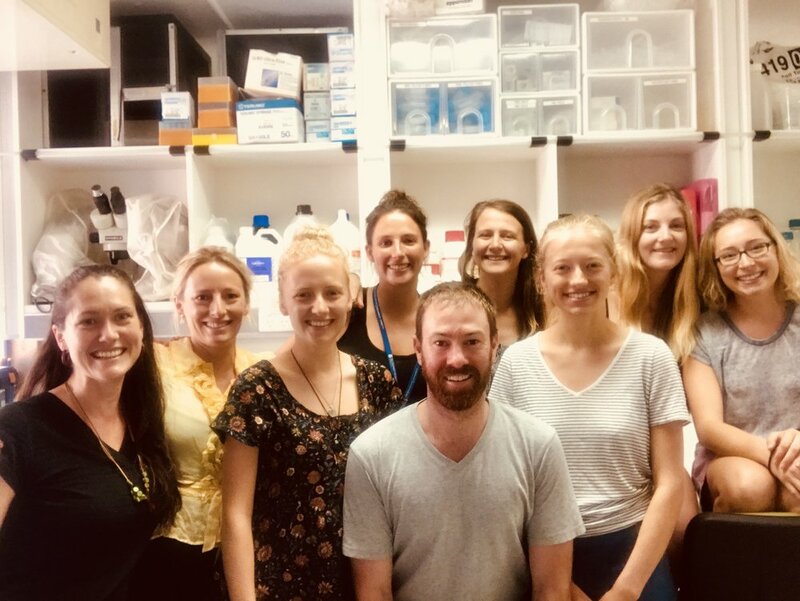 What a welcome Ellie and Hannah got to the Wilson lab - both ladies just started their Honours on Monday (Bio's and research projects to be posted soon) - and have had a true introduction to what they can expect for their upcoming year. Lizard equipment, 3D camera setups, security cameras, field camera traps and every imaginable computer cable you can think of! The final product of the Wilson lab - clean and organised and ready for a jam packed year of data collection, sample analysis, fun times and definitely many more crazy experiments - bring on 2018! Fun afternoon of everyone pitching in - in true Wilson Lab spirit! Of course we had to all head out and discuss the success over many enjoyable cold beers! Kaylah getting to enjoy the new clean lab bench space - happily mounting bandicoot hair to glass slides - which are about to undergo a new and exciting laser analysis methods for Mn content at QUT.